Another successful Christmas Fair took place at The Shed @ The Adam Eastwood Building on 2 December. Around 750 people attended the event, which was a real community effort. It was organised by Warsop Community Volunteers from across the Parish including Julie Jackson (WYC), Bill Power, Grant Simpson (Sport4kidz), Susan Barrass and Samantha Wilson (Surestart Parent Group), Geoff Snare and Arty Parkin (Warsop & Shirebrook District Rotary), Ruth Riches, Helen Tomlinson and Christine Parkin (Warsop Inner Wheel), Lee Butcher (sf4kids), Frances McLaughlin (Churches together), Andrew Melles and Cara Bostock (Warsop Scouts) and Maddy Pritchard (Vibrant). There were also extra supporters on the day including Jake Simpson, Nigel Jackson, Chris Wade, Kath Pritchard, Sharon Pritchard, Patricia Pritchard, Lisa Butcher and staff from Warsop Co-op. Edwinstowe Lions provided their sleigh for the Rotary Santa Ted Smith. A massive thank you to everyone who was involved. 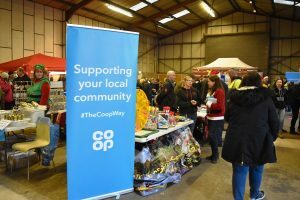 The first Christmas Fair at The Shed was held in 2016, supported by a £1,000 grant from Big Warsop, which helped to kick start the event. This year the organisers were keen to try and run the event with the £300 in the kitty from last year’s event. With the promise of some wonderful performances from local schools this budget could not stretch to cover hiring PA equipment for the performers and a successful application was made to the RoLo / Community Chest to cover the cost of hiring PA and a team to run it. 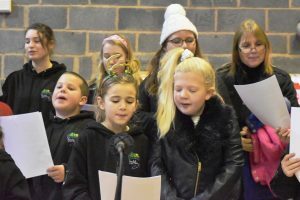 There was plenty of music on offer too from Birklands School Choir and Voices of the Vale Children’s Choir, as well as community carol singing. The Co-op generously provided 500 selection boxes for Santa Claus to give out to local children. As well as Santa’s grotto, there were plenty of other activities on offer. Surestart Children’s Centre ran craft activities with a chance for people to try their hand at icing biscuits for Christmas. 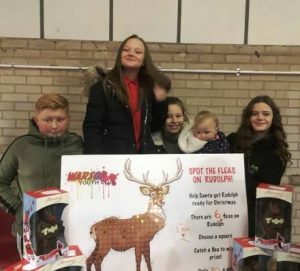 Meden Vale Children’s Group offered a craft activity and there was a tombola and games – including a fundraising ‘find the flea on Rudolph’ game run by Warsop Youth Club’s Youth Board. Warsop Inner Wheel offered sustenance in the form of soup and cakes, and there were bungee trampolines and fair ground rides – something for everyone, in fact. The meeting will be held at The Plough Inn, Warsop on Tuesday 13 February at 7:30pm. Everyone is welcome to attend the meeting to give their feedback and to find out how to get involved as a volunteer for next year’s Christmas Fair.